The temple is located on the near outskirts of Chinatown in a three-story edifice surrounded by a new condominium development, which is presently in the throes of heavy construction. The temple is easily identified with the help of two large signs, one in ancient Chinese script and the other in French (Figure 1). A fellow classmate and I visited the Centre D'Étude on five separate occasions between February and April of this year. During this three-month period, we were primarily in contact with one individual, employed by the temple in an administrative capacity. Our research was gathered in installments, for with each visit, our contact revealed only a handful of details regarding the temple's function and activities. The Centre D'Étude is a Chinese folk religion temple. This tradition adheres to the syncretic belief system, san-chiao yi (the Three Religions are One), so common within the Chinese religious context, which is a melding of practices and beliefs taken from Taoism, Buddhism, and Confucianism. The blending of these three principal Chinese traditions with ancient secular practices has produced an original synthesis known as popular or folk religion. Christian Jochim explains that "the term Chinese Folk religion . . . simply designates the unwritten religious beliefs and practices of average people within traditional Chinese Society" (5). This is a very apt description for the Centre D'Étude, a temple entirely run and patronized by a lay community, comprised of Vietnamese Boat People, who worships seven traditional Chinese deities in individual devotion. 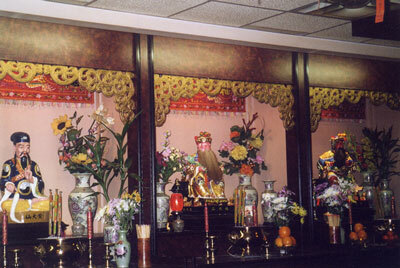 The temple's patrons dedicate their worship to the Empress of Heaven, Guanyin, and five local Hong Kong deities. There is no organized ritual or canonical text. Our contact at the temple asserts that this belief system is a way-of-life philosophy, rather than a religion, as we understand it in the West. 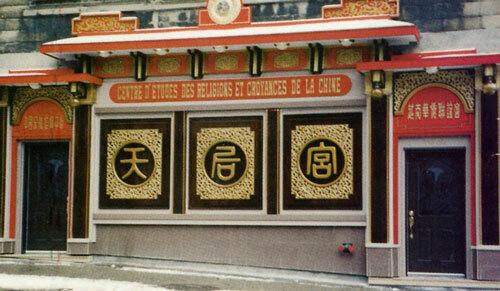 The temple does not appear to be connected with any other temples in Montreal, but it is affiliated with L'Association des Chinois du Vietnam a Montréal, Québec. When asked if the temple was associated with any others in Montreal, our contact named two temples dedicated to Guanyin, one in Côte des Neiges and the other in Brossard. Our contact maintained that the temple had no official affiliation with these temples but offered their names as examples of local temples with similar doctrines and practices. The Centre D'Étude was founded in 1990. It was originally located on Rue de la Gauchetière until the space was rented to another tenant. The temple moved to its current location on Bleury Street in 1997. The temple was founded by a group of Vietnamese Boat People, who risked their lives on the seas and who owe their gratitude to the Empress of Heaven, the principal deity enshrined at the Centre D'Étude. The goal of the community was to erect a structure and organize an institution similar to the temples dedicated to this deity common in southern China, particularly Fujian Province, and on Taiwan. As mentioned above, the temple is entirely run by a lay community comprised of Vietnamese Boat People. A permanent staff is employed to run the temple from 12 p.m.-5 p.m. from Monday to Friday, although the doors of the temple remain open to the public throughout the week. Through the course of our research we were often told that the permanent staff was too busy to attend to our inquiries, which led us to believe that the activities of the temple go far beyond what we had access to. In addition to the staff, the temple is governed by a board overseen by a president, who unfortunately passed away in March of this year. Our contact informed us that the temple is part of L'Association des Chinois du Vietnam à Montréal, Canada, but to what extent this association has control over the temple is unclear. It appears that this mother organization is a government-recognized group that permits the temple, by proxy, to be acknowledged as a legal and legitimate institution. We were in contact with two men who are permanent employees of the temple. Their activities appear to be administrative in nature, activities that keep them extremely busy throughout the week. From what we could gather from observation, the permanent staff is in charge of organizing temple activities and festivals, collecting donations, and overseeing the general upkeep of the institution. Our contact made it very clear that although the members of this community emigrated from Vietnam to the West, they are in fact ethnically and culturally Chinese. Language often proved to be a barrier throughout the course of our research, as we soon learned that only two members of the permanent staff, and very few participants, spoke either English or French. Cantonese, Vietnamese and even some Mandarin are spoken between members of the community. Therefore, the majority of the congregation and staff appear to have immigrated to Canada themselves, and few to none were born in Canada. For the most part, the congregation is comprised of individuals over the age of forty. On only a few occasions were there young children spotted inside the temple. Because of the language barriers, we were not able to communicate with any patrons of the temple. In fact, we came to know very little about the nature of the congregation itself. When asked about the size of the congregation, our contact was unable to give us any concrete figures. There is no official membership program, and the temple organizers do not keep track of who is taking advantage of the space. Our contact told us that during the Chinese New Year, the most important time of the year for the temple, literally hundreds of people cram into the small temple. Individuals are not required to pay a fixed rate for the opportunity to use the temple, but donations are required of anyone who makes use of the space. Two large donation boxes sit in the temple, but it is not obvious how the staff implements the giving of donations. They appear to rely on an honour system. As well, several lanterns hang from the ceiling, to which are attached small banners inscribed with family names. Our contact revealed that a family must pay one hundred dollars to have a lantern hang from the temple ceiling for one year. Similarly, large, illuminated, rotating towers, comprised of hundreds of small sections, sit on either side of the inner room. Each section of the tower is enclosed in plastic and has an engraving of the Buddha on the back of it. Adherents may purchase fifty sections for one hundred dollars and put their family name on them (Figure 2). It was explained that both the lanterns and the tower sections were meant as offerings to the deities of the temple in the name of the supplicants, specifically aimed at the Empress of Heaven. When the Vietnamese War finally came to a close in the 1970's, hundreds of thousands of people fled the country in hope of evading the Communist Regime that was imposing political authority over the nation. As well, many fled to search for a better way of life elsewhere after witnessing nearly twenty years of war. From 1978-1981, thousands of people took to the seas in small, unseaworthy boats with few personal belongings and attempted to make their way to Thailand or any nearby port (www.civilization.ca). A vast majority of these Boat People were in fact ethnic Chinese who most likely began to emigrate from Mainland China with the advent of Communism in 1949. The journey was a tumultuous one in the dilapidated boats: disease and drowning took many lives. Thai pirates often ransacked boats for treasures and took young women from their boats as souvenirs (www.boatpeople.com). For those that survived the traumatic journey, most landed on the shores of Hong Kong, de-routing from their course to Thailand as a result of terrifying encounters with pirates. Once in Hong Kong, they established refugee camps and many Boat People began the long process of applying for entry into a country of their choice. According to one source, Canada was among one of the preferred destinations; approximately 137 000 refugees landed on Canadian soil (www.civilization.ca/migration.html). This mass exodus of refugees from the shores of Vietnam continued throughout the 1980's. Hong Kong refugee camps housed Vietnamese Boat People into the early 1990's (www.boatpeople.com). Because of the importance of the ocean to the history of the Boat People and to Southeast Asian culture in general, the Empress of Heaven was selected as the Boat People's principal deity to whom they have built temples all over the world. However, worship of the Empress of Heaven goes back much farther into the history of Southeast Asian culture. In the 16th and 17th centuries, Chinese left the mainland in junks to make their way to Taiwan. The travelers were from "coastal communities of South China, where [the Empress of Heaven] was a favorite deity" (Jochim 149-50). Her cult spread to Korea, Japan, Southeast Asia, Europe and the Americas through "migration and trade routes," but her most devout following remains in Taiwan, where her "worship is so widespread that she is virtually the patron of the province" (Nyitray 165, Jordan 109). According to our contact, the ancestors of the Centre D'Étude congregation migrated from coastal China to Vietnam via the ocean around the turn of the 20th century; it is possible that some patrons of the temple made this voyage personally. Therefore, the Empress of Heaven figured as a prominent deity in the lives of ethnic Chinese living in Vietnam before they escaped in the mid-1970's. As mentioned above, the doors of the temple remain open to adherents throughout the week for individual and personal worship. There are no organized rituals per se, but rather a handful of events and festivals for which the temple provides a sacred space and a convenient meeting ground. A member of the permanent staff manages the "gift shop" on the ground floor of the temple and prepares the readings or prayers for important holidays, although it is unclear from whence these texts derive. Such festivals include the Chinese New Year, the birthdays of Buddha, Guanyin, and the Empress of Heaven. As well, the first and fifteenth day of each lunar month are designated days for adherents to visit the temple and make offerings and donations. The most important festival of the year is the Chinese New Year celebration at which time the temple plays host to hundreds of people. Our contact explained that from 10 p.m. New Year's Eve to 2 a.m. New Years Day, the congregation ushers in the New Year by collectively counting down as they watch the clock. Although we were not sure how literally to take this clock-watching event, our contact likened the experience to Times Square during the western New Year celebrations in New York City. We visited the temple for the first time on New Year's Day and were able to witness some of the celebrations. The seven statues of the deities that make up the pantheon of the temple were surrounded with offerings of food, oranges and red lucky money envelopes. Incense was burning at an incredible rate and a few individuals were circulating the room, stopping to bow before the deities on small square benches common to Chinese Buddhist temples. Also remarkable was an elderly gentleman who sat in a corner beside a large bell striking it incessantly, never faltering from his own rhythm. At one point he stood to add some drumbeats into his rhythm, and then returned to his original position beside the bell. On a subsequent visit, we made a donation to the temple ourselves. As the change hit the bottom of the donation box, a temple employee proceeded to ring the bell. Therefore, we concluded that ringing the bell is an auditory signal to the gods that offerings are being made to them. In the back room of the temple, a group of adherents had gathered to share a meal and one young man was receiving a lesson on how to pray properly to the altar at the back of the kitchen space. He was being instructed on how to hold his bushel of incense, where to place it on his body, and how to coordinate his bowing. 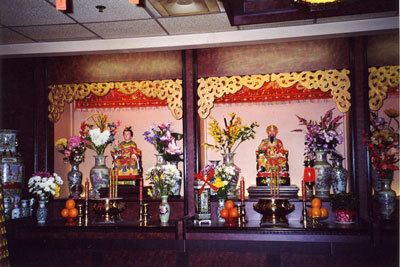 The temple celebrates the birthdays of Buddha, Guanyin and the Empress of Heaven. Our contact did not describe at length the birthday celebrations; however, donations and offerings to the temple and to the gods are standard practice at any time of the year. The first and fifteenth of every lunar month are designated visiting and worshipping days. Although the doors are open for business every day, these two specific days of the month are the closest the temple comes to regular services. On these prescribed days, a sizeable amount of the congregation comes to give offerings to the gods, to give mandatory monetary donations to the temple, and to share in a vegetarian meal, out of respect for Guanyin, a Buddhist deity. The building itself is a three-tiered structure. The ritual space is located on the ground floor, an office on the second and a "mystery" on the third floor (we were never invited to the third floor to see what activities took place there). The ritual space on the ground floor is divided into three sections; open doorways make these divisions so there are not in fact three separate rooms. The "gift shop" and two altars are the main features in the first section. Directly in front of you, as you enter the ritual space, is a long glass counter within which are some small statuettes of the Buddha in various incarnations as well as a few of the Empress of Heaven and Guanyin. 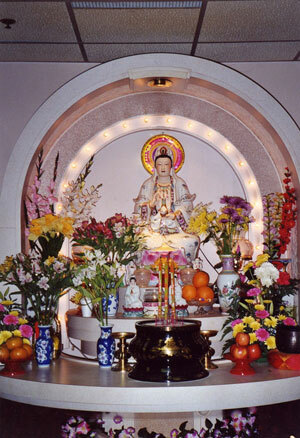 Directly to your right upon entering the temple is a sizeable altar to Guanyin (Figure 3). She has a neon disco-esque halo surrounding her head and a small wishing-well pond beneath her, into which people have thrown some pennies. On the walls of this section are several plaques commemorating the founding year of the temple (1990) and the date that it relocated to this site (1997). A smaller, inconspicuous altar hidden behind the front door contains only some incense and a smattering of oranges. The purpose of this altar was never explained to us nor did we ever witness anyone attending to it. The second section is the true centre of the ritual space, as it contains the remaining altars of the six deities worshipped by temple-goers. The first and largest altar is that of the Empress of Heaven in front of which are the majority of the square prayer benches and the most offerings (Figure 4). 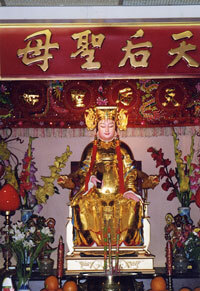 The prominent, golden Chinese characters above her altar translate to "Heaven Empress Holy Mother." Along the right wall of this second section are five altars to five local deities. Also inside this main area are the two illuminated, rotating towers, lanterns, and the bell and drum as discussed above. Along the left wall of this section is a large, impressive metal art installation depicting what was described as a New Year's scene; the work portrays a handful of smiling young boys pushing a wheelbarrow overflowing with money and gifts. Traditionally, young boys are associated with fertility; bearing sons is itself an exceptional gift. Ancient lore reveals that those who properly observe the New Year by presenting the gods with offerings will be visited by the young boys who will in turn bestow the virtuous with monetary gifts. Our contact likened these childish figures to the western notion of Santa Claus. 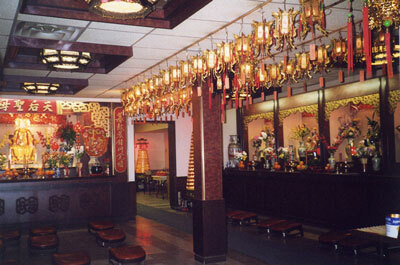 The third section of the ground floor serves primarily as the common dining room for temple patrons. Along the back wall is one final altar, which was described as a "star" altar. This altar is connected to Chinese astrology. Individuals only pray to it in their astrological year (i.e., horse, dragon, rabbit, etc . . .) to change any negative fate that has been slated to fall upon them in that year. On our second visit to the temple, when we explained to a temple employee that we were students interested in learning about the history and function of the institution, we were immediately escorted to the kitchen at the back of the temple. Hanging on the wall was the biography of the Empress of Heaven. Our contact immediately began to translate the story from Chinese into French, while I simultaneously translated it into English for the benefit of my research partner. Our contact referred to this deity as the Goddess of the Ocean, an appropriate title for a temple founded by Boat People who have understandable cause to praise one who bestows mercy on sea-goers. This title, however, did temporarily throw us into terrible confusion, for although the Empress of Heaven has an extensive list of alternate names (Tianhou, Matsu, Heavenly Consort, to name just a few), the Goddess of the Ocean is not among the most common. It appeared that this temple employee believed that all of our questions regarding the temple would be answered once we were familiar with the story of its principal deity; he was not altogether wrong. The biography of the Empress of Heaven is fairly well documented although the numerous accounts differ on some small details of her life and the miracles that shaped her hagiography. Information about this deity is readily available which attests to her vast popularity in Asia at large. In fact, "[t]hroughout cultural China, the goddess Tianhou (Empress of Heaven) ranks second only to the Buddhist bodhisattva Guanyin as a female object of popular devotion" (Nyitray 165). Most versions of her life story agree that she was born on the 23rd day of the 3rd lunar month in 960 CE in Fujian Province in southern China, a date which was corroborated by our source at the Centre D'Étude (Nyitray 167, Thompson 59). The version of the biography followed by the temple describes an auspicious birth: Guanyin appeared to her mother, a Buddhist, in a dream and gave her a dose of magical medicine. When her mother awoke, she discovered that she was pregnant. The Goddess began to study Confucianism and Buddhism diligently at a very young age. At the age of twenty she met a "Daoist fairy or water sprite who gave her a bronze talisman with which she later exorcized evil spirits, healed the sick, and performed other shamanic tasks" (Nyitray 168). The temple's adaptation of the above miracle differs slightly, for it holds that she received the magical bronze object at sixteen when she fell into a well and emerged completely dry. Her second celebrated miracle unfolded as she dreamed; she rescued her father and brother from certain death upon the stormy sea. According to the temple's account, she thereafter dedicated herself to Buddhism; however, it makes no mention, as do almost all other sources, of her refusal to marry (Nyitray 168). The Empress of Heaven is regarded as a saviour-figure. In fact, it is well documented that she brought rain to a starving village suffering from a prolonged drought; her mastery over water is one of her most pervasive characteristics. She is said to have died in her twenties, although sources vary on the exact age. It is widely believed that she posthumously dedicated herself to "the protection of maritime . . . communities" and, therefore, has become the patron saint for sea-travelers (Nyitray 168). Remarkably, the Centre D'Étude includes Guanyin into its pantheon, for she and the Empress of Heaven wield similar powers and are linked by a comparable humanitarianism. Just like the Empress of Heaven, Guanyin is often associated with the ocean: "she is invoked by sailors in distress to whom she appears over the waves" (Eder 177). Similarly, both Guanyin and the Empress of Heaven are attributed with characteristics of benevolence, compassion and the ability to deliver smooth and safe childbirth (Nyitray 170-71). Vivian-Lee Nyitray writes of the Empress of Heaven: "there is a long-standing tendency to associate or conflate the goddess with the Buddhist bodhisattva Guanyin, typical of the syncretic impulse common to Chinese religion" (176). However, at the Centre D'Étude these two goddesses are considered two different and definable figures who serve two distinct purposes, and who are worshipped individually from each other. The pantheon of the Centre D'Étude includes five other deities, which were described as local Hong Kong gods. If the majority of the temple's congregation were among the Vietnamese Boat People who lived in Hong Kong refugee camps before immigrating to Canada, it is fitting that these deities were deemed "local" divinities. We asked our contact to identify these five statues and give us a summary of their biographical history and divine function. Although he was uncertain about the specific details relating to each figure, our contact named them, going from right to left, as the gods of Loyalty, Longevity, Wisdom, Fate and Child-Protection. These titles were given to us in French; the above English names are literal translations. The first statue, the god of Loyalty, is the most distinguishably canonical figure of the five (Figure 5). Our contact explained that this deity was in fact a real person from ancient Chinese history who persevered in the face of temptation and remained loyal to his fellow generals in their plight to conquer and unify the nation. Further research into this figure proved fruitful, for Guan Gong (Kuan Yü, Kuan Kung) is indeed a popular addition to the traditional Chinese pantheon. Guan Gong is most often described as "a great hero and warrior and a man of virtue and high character who lived at the close of the Han dynasty and the beginning of the Three Kingdoms" (Graham 201). He has also been bestowed the title of god of war and in some cases, the god of literature and wealth (Shryock 67). Of the five local gods worshipped at the Centre D'Étude, our contact appeared to know most about Guan Gong, particularly his biography and his subsequent legend. There is good reason, however, for this uneven balance of familiarity, for Guan Gong's "character and exploits were popularized in the great work of historical fiction entitled The Romance of the Three Kingdoms, written during the fourteenth century" (Thompson 59). Our contact had more trouble introducing the remaining four gods most likely because they are not specific historical figures, but rather embodiments of spiritual ideals and aspirations. According to our contact, beside Guan Gong is housed the god of Longevity (Figure 5). Our contact pointed out his long white beard, which illustrates the god's own attainment of long life, but he conceded that he did not in fact know the story behind this deity. In regard of the Chinese worldview, in which elements of Taoist immortality and ancient sages are prevalent, this statue is fitting and yet, it is not strictly representative of Taoism. In fact, this god is more often associated with bearing good fortune upon supplicants than with the notion of longevity. Coincidentally, as reported by our contact, the next altar houses the god of Wisdom; this statue is blatantly imbued with Taoist iconography (Figure 5). The god's robe is emblazoned with several Yin and Yang symbols, and in his right hand, he holds a calligraphy brush. His left hand is positioned with the index finger pointing to the ceiling, an iconic standard for Taoist sages and immortals. A further examination of these local deities, however, proved to contradict our contact's information. For Example, the Chinese characters inscribed beneath the god of Wisdom reveal that he is the "Yellow Great Immortal" and, therefore, better suited for the title of the god of Longevity. The god of Fate is seated next, wearing a typical dragon-printed imperial robe and holding a stamp in his right hand, indicating his bureaucratic function (Figure 6). This stamp is displayed in the form of a gold pyramid. Our contact noted that this god was most common in Hong Kong; however the idea that one's fate is preordained and sealed in the celestial Registers and that it can only be changed by appealing to celestial bureaucrats is a notion held throughout the history of Chinese cosmology. The assumption is that if you pray to this deity to change your fate, he will stamp the celestial Registers to seal this new version of your future. To the left of the statue is a windmill-type structure, which our contact compared to a wheel of fortune. Windmills are set into motion by the course of the wind, but their direction will alter when the wind itself changes course. This imagery becomes pertinent when we consider that changing the course of one's fate is analogous to changing the direction of the wind. The last of the gods enshrined in the temple is the god of Child-Protection. According to our contact, infant mortality was very high in ancient China and, therefore, it became common practice to pray to a deity who would guard the lives of children and protect mothers from troublesome childbirth (Figure 6). Figure 7: Popular Taiwanese gods (Thompson 54). 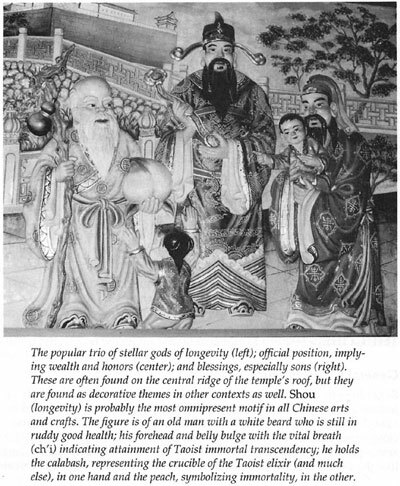 In his book, Chinese Religions, Laurence G. Thompson includes a photograph of three typical Taiwanese deities (Figure 7). The three gods depicted represent longevity, wealth and fertility. Although iconic details of these statues vary from those enshrined in the Centre D'Étude, the statues are imbued with a remarkably similar significance, pointing to the popularity of these traditional figures. Generally, adherents believe that in praying to the gods of the temple they can improve their fortune, monetarily or otherwise. They give thanks, or bribes, to the gods in the form of offerings to secure such personal benefits. Christian Jochim writes: "the simple rite of pai-pai (bai-bai) - a show of hospitality involving incense, food, offerings, kneeling, and bowing - was the central ceremony of Chinese folk religion" (14). Although the activities of the Centre D'Étude were never described as such during our visits, this is a very apt account of what we observed as the focal point of ritual performed at the temple. During the course of our research we visited the Centre D'Étude on five separate occasions. It took several meetings before suspicions over our presence were quelled, enabling us to gather any information about the activities and purpose of the temple. The temple-staff, regularly limited by time constraints, had little time or desire to attend to our inquiries. This temple serves a very inclusive and specific community and need not open itself to outsiders nor present itself as an attractive spiritual alternative to Montrealers at large. As a result, our contact could not, or would not, provide information about rituals, rites and doctrine. We therefore, had to rely on our general observations. This task was impeded by the absence -- other than on our visit during the New Year celebrations -- of individuals practicing within the ritual space. What struck this researcher as the most fascinating aspect of this institution was the adherents' devotion to the Empress of Heaven as their own personal saviour figure. The members of this community of Vietnamese Boat People believe they have witnessed the miracles of this traditional deity in the modern age. They continue to pay homage to her acts of mercy and compassion and have erected this temple in her name, transplanting popular Asian culture to downtown Montreal. I would like to thank Beatrice Recio, my research partner for the last three months. I would also like to thank the Centre D'Étude des Religions et Croyances de la Chine a Montréal, Canada for their time and help. I would particularly like to thank Mr. Diep who met with us on several occasions and provided us with the information regarding the temple found in this report. Matthias Eder, Chinese Religion, Asian Folklore Studies Monograph no. 6 (Tokyo 1973). David Crockett Graham, Folk Religion in Southwest China (Washington: Smithsonian Press, 1961). Christian Jochim, Chinese Religions: A Cultural Perspective (New Jersey: Prentice Hall, Inc., 1986). David K. Jordan, Gods, Ghosts and Ancestors: The Folk Religion of a Taiwanese Village (Berkeley: California UP, 1972). Vivian-Lee Nyitray, "Becoming the Empress of Heaven: The Life and Bureaucratic Career of Mazu" from Goddesses Who Rule, ed. Elisabeth Benard and Beverly Moon (New York: Oxford UP, 2000) 165-180. John Shryock, The Temples of Anking and Their Cults: A Study of Modern Chinese Religion (New York: AMS Press Inc., 1973). Laurence G. Thompson, Chinese Religion: An Introduction, 5th ed. (California: Wadsworth Publishing Company, 1996). Figure 7: Laurence G. Thompson, Chinese Religion: An Introduction, 5th ed. (California: Wadsworth Publishing Company, 1996) 54.